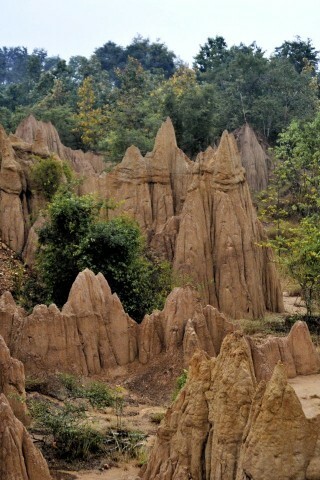 The Sao Din site displays an intriguing and picturesque landscape of eroded sandstone pillars, columns and cliffs similar to neighbouring Phrae’s Phae Mueang Phi Park, Pai Canyon or Mae Wang National Park’s Pha Chor. Browse places to stay in Nan on Booking.com. Book Now - Pay Only When You Stay. The latter is the most spectacular and Pai Canyon the most extensive but Sao Din is definitely more eye-catching than Phrae’s much touted ‘City of Ghosts’. In Phrae you’ll find a carpark, maps, information, cafes and snack bars as well as nicely laid out routes, viewpoints and salas but Nan’s version has... nothing. It’s barely indicated, roads are unsealed, there are no cafes or car-park, there’s zero information that we could find, no maps (in any language) and no properly laid out paths or trails. The problem perhaps is that Sao Din Na Noi is in the middle of nowhere and on the way to nowhere else. Sao Din Na Noi, as the name implies, lies in Na Noi district, approximately 50 kilometres due south of Nan city on Route 1026 via Wiang Sa on Route 101. The site is a few kilometres beyond Na Noi, so around 60 kilometres in all. Public transport will get you to Na Noi town from where a motorbike taxi will have to suffice for the last stretch though by motorbike from Nan you’ll need to allow three hours on country roads for the return trip. Unlike Tham Pha Tup, which is located on the highway up to Nong Bua and Pua, Sao Din can’t really be combined with a visit anywhere else. You can break up the journey with a stop at Wiang Sa -- a large market town with a couple of old temples and a bustling market -- but Na Noi doesn’t have any other sites as such. From here you can head west on Route 1216 which, after a long, hilly ride, eventually rejoins Route 101 north of Phrae, while continuing south will see you at the scenic Sirikit Dam in Uttaradit province. Continuing east you can eventually work your way round to Mae Charim district, which has a national park of the same name and from where you can get back to Nan on Route 1168 but that’s quite a drive. Sao Din Na Noi is a pleasant spot for a wander, with some trails leading through the unusual rock formations and into the low scrubland around with its plentiful birdlife. Stone axes and tools have been found here – they are currently on display at the National Museum – indicating that the area was the site of Neolithic activity. It may be best done for convenience’s sake as part of Fhu Travel’s south Nan day tour, which will also includes a tour of Wiang Sa market and some viewpoints and handicraft spots not easily found on your own. Last updated on 26th March, 2016.